I’ve recently confirmed that Emilia’s is my favorite pizza in the Bay Area. I doubted my first impression,as it was formed under extenuating circumstances. I had a dentist’s appointment near Telegraph and Ashby and discovered once I got out of the dental office it was unexpectedly raining and my front tire was unexpectedly flat. So I walked along Ashby to catch the bus, in pouring rain, and remembered hearing about a great, new pizza place, Emilia’s. I ran in, and luckily there was a pizza available about 10 minutes from when I ordered. At the time, I didn’t realize how valuable that was, as it was near the beginning of the business, when he transitioned from offering tempting slices to offering only as many pizzas as he could personally make and put in the oven, most of which were sold out by phone orders by early evening. But I got my Margherita pie in the quoted time, and saw the confusion of the neighborhood kids who came in after me, when told the first available pizza would be about an hour and a half from when they ordered. I tried one slice there, and the rest rewarmed when home. It was, without a doube, the best pizza I had ever picked up on the bus route home during an unexpected rain storm. But I needed to sample it again. But I’m horrible at calling for reservations, planning ahead, or dealing with such situation, no matter how egalitarian and straightforward they are (which they definitely are in the case of Emilia’s). Also, in the past year I’ve ditched the car, which has worked out well, but makes pizza transportation difficult. In fact, it’s one of my parents’ set stories how, on some early int the dating process date, my dad brought my mum a pizza, but rode his bike and carried it vertically, so I’ve always known the dangers of such actions. But I finally managed to order and transport another pizza from Emilia’s, and it confirmed my initial suspicion that it is my favorite in the area. There are always heated debates about the best pizza, and many East Coasters claiming that nothing outside of their hometown is good pizza. There are many who say that you define good pizza as the pizza you grew up with, though I’d modify that to indicate that it is likely you will define good pizza as the first great pizza you encounter. I grew up in Iowa City, IA and while I don’t mean to disparage their good pizza places (Paglia’s) most of my exposure was to chains. In fact, I still have an embarrassing soft spot for Pizza Hut Personal Pan Pizza since their ingenious marketing scheme aimed at elementary school students. All you had to do was report to your teacher that you read a certain number of books that month and you would get the certificate for a free personal pan pizza. It was amazing, because the personal pan was only available to Book It winners at dinner hours. And of course you brought your parents who had to order something else, since they probably wouldn’t let you go to a restaurant yourself under the age of 12. A spectacular marketing scheme, and a spectacular “buttery” crust. Even now that I recognize that the substance crisping and caramelizing the thick layer of crust is an artificially flavored, butter-like substance I still salivate at the thought of a Pizza Hut Pan Pizza. But don’t let that last paragraph fool you into thinking I have ridiculously low standards in pizza. I’m embarrassed about that portion of my personality. I first got really into pizza when I spent a semester in Rome and you could get a perfectly cooked, always flavorful, thin-crust pizza for about $9. Not to mention the carafe of wine for another $8 or so. The crust was always thin, tasty, and blistered slightly. The sauce was fresh, flavorful, and delicious, and the toppings were always harmonious. I even went to Naples, the supposed birthplace of pizza, and while I thoroughly enjoyed my pizzas there the thicker dough and less fluid buffalo mozzarella made me prefer the derivative (but tried first by me) Roman pizza to the ur-pizza, Neopolitan. So, my preferences being stated, Emilia’s is like a giant, American-sized Margherita pizza. (speaking of which, one of the things that makes me most angry in life is when a “margherita” pizza is no sauce with fresh tomato slices on top of mediocre cheese. No. It’s as if the makers of this pizza just read the rules of VPN (Vera (true) Pizza Napoletana) which indicate tomato, mozzarella, olive oil and basil as the definition of Margherita. Though technically the poor-quality tomatoes atop bad cheese meet that sentence’s description they are nothing like the Margherita’s I had in Rome or Naples. And the poor interpretation of dried-out, flavorless tomatoes atop dried-out cheese is not appealing to me, and I can’t imagine how it would appeal to anybody. So, with my background, Emilia’s is the best. The crust is thin like the Roman pizzas I tried, and flavorful (which means properly salted and raised). The sauce was delicious, one of the elements that most often rules out pizzas outside Italy. They either like to use a very cooked sauce, which concentrates flavor, but becomes too sweet and caramelized for my taste, or have a fresh sauce with little flavor (this is how I feel, in general, about my neighbor Lanesplitter, thought it still rates as decent on the overall Bay Area pizza list) . But Emilia’s hits all the notes I’m looking for: tangy, flavorful, fresh sauce, blistered crush, decent cheese. And even though on many measures of surface pizza it is not the ideal Roman pizza I’m looking for (It’s cut in wedges, like NY slices, not little squares like Italy, it’s big, like the USA, and only available size, and offers only a few toppings and an ordering experience which is difficult for me) but because it is delicious pizza no matter where you are. 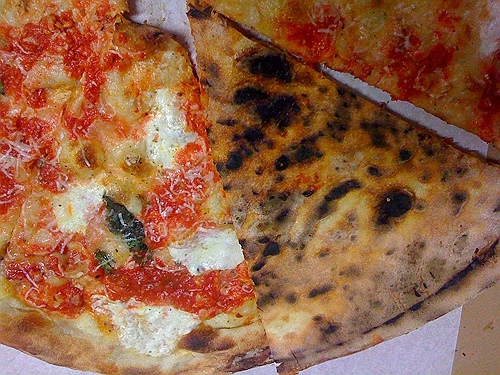 This makes it sound less than it is, but often in the age of pizza, less is more. And this wine wins on both accounts. It is quite interesting to me, as it different from anything I have tasted before. It seems that the Canary Islands encourage growing in volcanic rock and this wine definitely had a more mineral flavor than I was used to (but definitely in a good way) and it was lighter bodied than I expected, almost like a Pinot Noir. Honestly my useless descriptions are why this isn’t a regular feature, but I enjoyed this and I got it at Paul Marcus Wines at Rockridge BART. And I’ll post things that are ususal to mem, but interesting in the future. I hope. 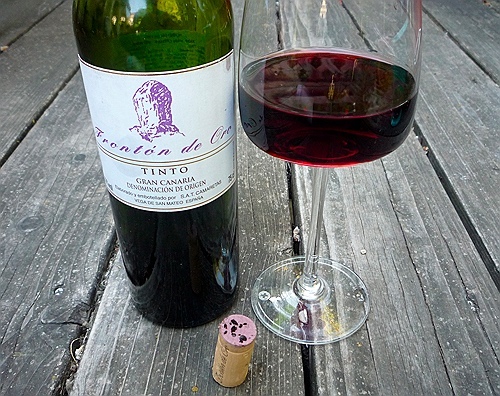 This wine is particularly interesting because it has a definitely different, in a good way, minerality. And it wasn’t just my imagination. 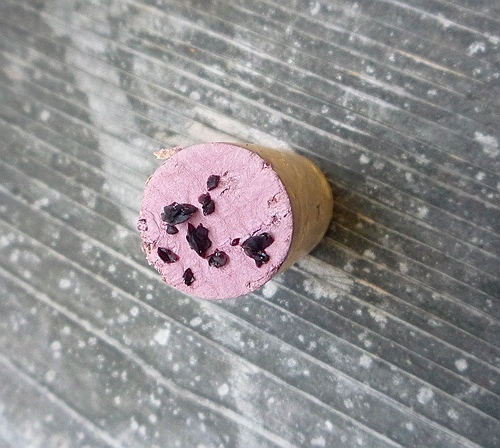 The cork and my first glass had plenty of inclusions, which were clearly lava rock. Look at the lava rock clinging! I liked having the novel experience of this Canary Island volcanic wine, and it went with the amazing pizza I ordered above.